In order to perform CRUD operations on entities, MVC frameworks expect you to first come up with the model definitions. The frameworks then provide you with a default CRUD form to interact with these models using an ORM. How about when we are working with NoSQL database? Or, in general, how can we define a “generic schema” which can work with any kind of database backend (relational or NoSQL or mixed)? The JSON data format is generic enough to handle the above cases of primitive and composite data types, and it is widely supported in almost all popular languages. So, in TAME, we came up with a mechanism to define the schema of an entity using JSON as the data format. In this post, we shall be using the term “entity” to refer to a single “table” of a relational database (or the equivalent of collections of MongoDB). We shall use the term “instance” to refer to a “record” in a database (or the equivalent of documents in MongoDB). Further, since JSON is serializable, we can also store this schema in a database and this will help us with a whole lot of things like modifying schemata without requiring a redeployment (DDL becomes DML when schema is also considered as data), schema versioning and schema migrations. Consider the following page showing testimonials written by various learners who have attended jnaapti’s training in the past. If this data were stored in a database, what would be the fields of the entity called “testimonial”? Every testimonial has a description, an author, and some of the author’s experience details like the company he is a part of and his designation. In a relational database world we store this in a table and each testimonial is a record. The company details could be a separate table. 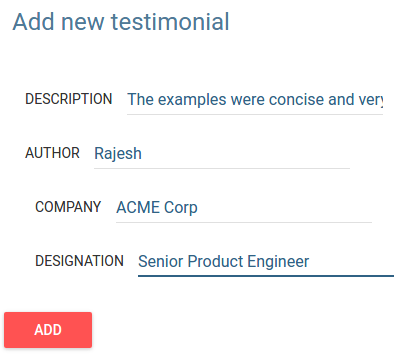 In a NoSQL store we can store the testimonial along with all related entities in a single record. In a relational database we typically start by defining tables and then start adding records. In a NoSQL database, defining the schema is not mandatory. However, it is preferred to define a schema for the purposes of validation, automatic form creation and all the benefits mentioned above. So let us assume that defining a schema is a good thing! We now need a language for the schema that is generic enough to support primitive data types and composite types. Define the fields that are a part of the testimonial entity. TAME now generates a schema and stores it in the database. Once a schema is added, we can now start performing CRUD on instances of the entity. Note that the JSON structure has no extra bells and whistles. So this makes it easy for us to import existing entities into TAME. 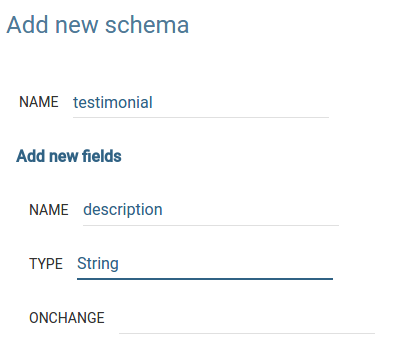 We also have a schema deducer that can help us define schema for existing entities. This allows us to consume data from a REST service and define a schema for it and we can then start performing CRUD operations on that entity in less than 5 minutes! Suppose we also want to store a list of all the technologies that we trained this person on as part of each testimonial. Let us now look at a cool feature of TAME. One nice thing about TAME is that CRUD on schema (adding new entity definitions) is done using the same editor that we use to perform CRUD on instances. Adding a new entity is basically about adding a new instance to the schema table/collection. The form is rendered using a schema’s schema definition which is stored in the database along with other schemata. 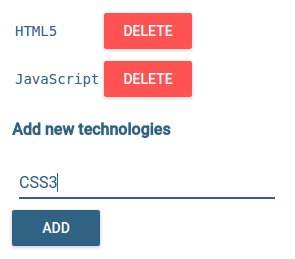 So we can do all this without writing a single line of code! This is just the beginning of the capabilities of TAME.